1. Big day for earnings: Dozens of big-name companies are reporting quarterly results on Thursday. Blackstone (BX), BNYMelon (BK), Domino's Pizza (DPZ), Philip Morris International (PM), Scholastic Corp (SCHL) and Union Pacific (UNP) are a handful of the key firms releasing earnings before the open Thursday. Then Microsoft (MSFT), Capitol One (COF), E*Trade (ETFC) and Skechers (SKX) will follow after the close. Unilever (UL) reported its second quarter earnings, but shares were steady in London. 2. Strong dollar, weak pound: The US dollar is going from strength to strength. The greenback posted gains on Thursday against a range of currencies, including the Chinese yuan, Indian rupee and Turkish lira. The US dollar index is trading near it's highest level in the past year. Investors have been crowding back into US assets as the economy powers ahead and yields on government debt increase. The UK pound continues to weaken and is now trading below $1.30, its weakest level in nearly a year, as investors worry about the risk of a messy Brexit in 2019. 3. Stock market movers -- eBay, Publicis, WPP: Shares in eBay (EBAY) dropped 6% in extended trading as investors react to the company's latest earnings. Shares in the European advertising giants Publicis (PUBGY) and WPP (WPP) are in rough shape after Publicis reported a large contraction in sales in the second quarter. Publicis stock was down 9% in Paris. Shares in WPP were down 4% over worries that the agency is also being affected by a continued slowdown in global advertising spending. Shares in Alcoa (AA) could be on the move after the aluminum producer cut its outlook for 2018 because of market prices and metals tariffs imposed by the Trump administration. 4. Global stock market overview: There's a fair bit of weakness in global stock markets. 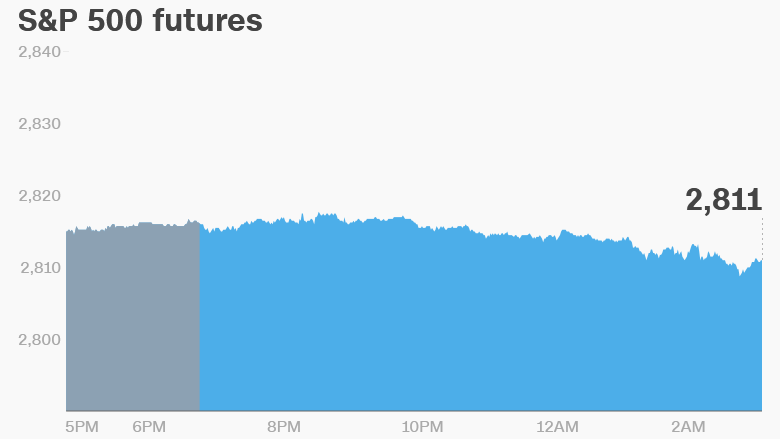 US stock futures dipped and European markets declined in early trading. Most Asian markets ended the day with negative results. The Dow Jones industrial average added 0.3% and the S&P 500 rose 0.2% on Wednesday. The Nasdaq was flat.